Central Texas is home to three newly-identified species of salamander, suggests new research. But encountering these fresh amphibian faces isn’t as simple as taking a walk through the woodlands fringing Austin. These salamanders—and more than a dozen close relatives—live deep underground in a network of flooded channels running through the Lone Star state’s porous limestone bedrock. And there, they may be more at risk of extinction than previously thought. The salamanders navigate a subsection of the hidden, stygian waterways of the Edwards-Trinity aquifer system, which stretches for tens of thousands of square miles across west-central Texas, far below the sun-baked surface. Despite being poor in nutrients, the aquifer is among the most biodiverse groundwater ecosystems on the planet. Some of its inhabitants are the descendants of ocean-dwelling species left behind from when the area was under a shallow sea about 100 million years ago, according to Tom Devitt, lead author on the study and an environmental scientist with the City of Austin’s Watershed Protection Department. Others, like the salamanders, moved in more recently, and have evolved into specialized cave creatures—pale and eyeless, with flattened heads and scrawny limbs. Some species are found only in single locations, like the Barton Springs salamander, and are federally protected. To better understand the evolutionary history of these salamanders, how they are faring today, and just how many species exist, Devitt and his colleagues looked to the salamanders’ genetics. They took more than three hundred genetic samples of the fourteen known species of groundwater salamander across nearly one hundred spring sites along the aquifer. By comparing thousands of genes between individuals, the team could determine where in the aquifer particular species were living. Their results, published today in the Proceedings of the National Academy of Sciences, indicate that the genetic divisions between salamander populations mirror the geographic series of isolated, subterranean fingers of the aquifer. Where the waters fork, so do the salamander species, showing that the physical, hydrogeologic features of the aquifer were instrumental in generating myriad twigs on the salamander family tree. In comparing the genetics of salamanders across the aquifer and drawing boundaries between species, the team discovered the existence of three totally undescribed species, genetically distinct from any known close cousins. One of these is a straw-colored critter, found only in a tiny area of the Pedernales River near Austin, that the researchers consider so rare and restricted in habitat that it’s critically endangered. The researchers also found that the previously-described Georgetown salamander, already considered imperiled, is limited to an even smaller territory than originally thought. Now that the new species have been identified, says Devitt, the next step is formally naming and describing them, something the team is currently doing. Revealing these species’ existence is crucial to their long-term survival, especially in light of urbanization threatening the aquifer’s water quality. The Cascade Caverns Salamander (Eurycea latitans) has both subterranean and surface-adapted forms occurring in the same population. Pictured are two individuals from Honey Creek Cave, one captured on the surface (top) and the other from within the cave. There’s also the impact of humans sucking more water out of the aquifer than can be replenished, causing the water table to drop. Devitt noted that some areas of the Trinity Aquifer have seen their water level drop of over 1,000 feet since the 1950s. 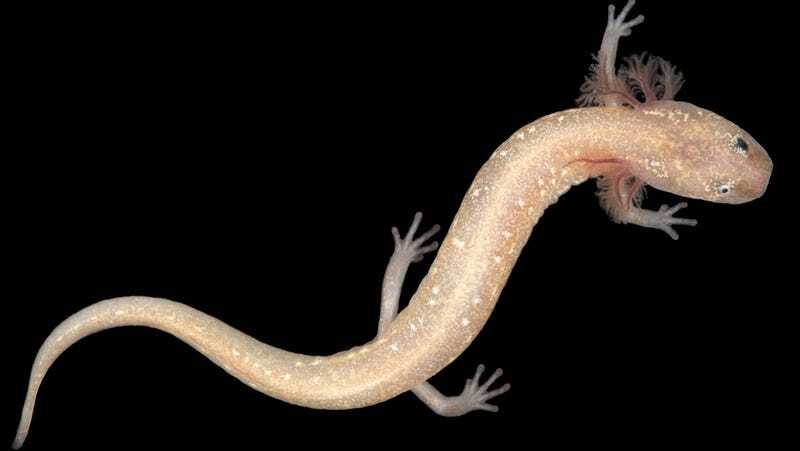 Despite being only thumb-sized, the salamanders are top predators in the aquifer ecosystem, which means humans allow these pallid wrigglers’ demise at their own peril. They are likely critical for maintaining the health and water quality of these sensitive aquifer systems, and their loss might compromise the region’s key water source in ways we don’t yet understand.